SpaceX loaded more than 75,000 gallons of liquid propellant into the Falcon 9 rocket Thursday for a pre-launch countdown test designed to wring out any issues with the launcher, ground systems and support teams before the mission blasts off to the International Space Station as soon as late April. Thursday's countdown served as practice for SpaceX and an exercise of all the equipment needed on launch day. 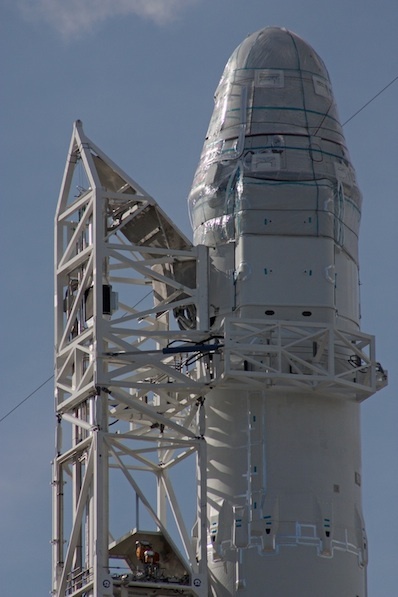 A brief ignition of the Falcon's nine first stage Merlin engines is scheduled a few days before liftoff. The privately-developed rocket was capped with a Dragon spacecraft. The capsule is heading to the International Space Station on a NASA-sponsored test flight, aiming to become the first commercial mission to visit the complex. If the spacecraft successfully reaches the station, SpaceX will affirm it is ready to begin crucial round-trip unmanned cargo missions to ensure a steady flow of logistics and experiments to and from the outpost. 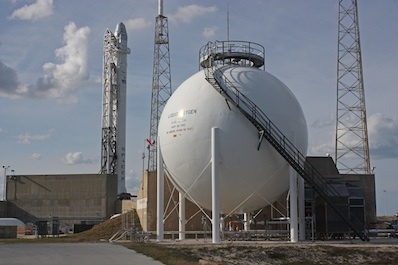 Thursday's countdown began at 7:23 a.m. EST (1223 GMT), and a crew of engineers inside the SpaceX launch control room oversaw the loading of rocket-grade RP-1 kerosene and liquid oxygen propellants into four tanks inside the two-stage booster on launch pad 40 at Cape Canaveral, Fla. The Falcon 9 rocket's first stage was filled with nearly 39,000 gallons of cryogenic liquid oxygen and almost 25,000 gallons of kerosene fuel. About 7,300 gallons of liquid oxygen and 4,600 gallons of kerosene went into the second stage. High-pressure gases were also loaded into the rocket Thursday. After missing its first appointed cutoff due to a technical glitch, the countdown ticked down to T-minus 5 seconds and aborted moments before the Falcon 9's main engines would ignite during a real launch. The cutoff came at about 12:18 p.m. EST (1718 GMT), then engineers sent the command to drain the rocket of propellant. U.S. Air Force range tracking radars were expected to conduct a test with the launcher later Thursday. On Friday, SpaceX plans to demonstrate methods of installing cargo into the Dragon capsule. The test will prove SpaceX's ability to load supplies into the Dragon spacecraft just before launch. The company will roll the Falcon 9 rocket back into its hangar, unbolt the Dragon spacecraft and continue with final launch preparations. The next milestones include final checks, fueling of the Dragon's orbital maneuvering system, and placing nearly 1,000 pounds of food, clothes and other supplies into the craft's pressurized cabin. Later missions will carry more cargo, including vital maintenance parts and costly experiments. 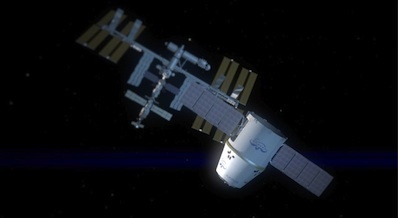 SpaceX holds a $1.6 billion contract to resupply the space station with 12 missions. The operational flights are due to begin later this year. The next flight, scheduled for launch in late April, is the culmination in a public-private partnership to design and build the Falcon 9 launcher and Dragon freighter. The Commercial Orbital Transportation Services, or COTS, program was conceived to foster private development of vehicles to supply the International Space Station. With the retirement of the space shuttle, SpaceX and Orbital Sciences Corp., NASA's other COTS partner, will be the only U.S. vehicles flying to the space station. NASA has agreed to pay $396 million to SpaceX in the COTS program. The space agency issues monetary awards upon the completion of major milestones, with the final payment due following the upcoming mission. The flight's exact launch date will be set after the completion of software testing and safety reviews to ensure the Dragon capsule will not harm the space station. SpaceX and NASA delayed the launch from February to give engineers time to address the issues. Other delays pushed the flight from last year into 2012.